Get Their Attention and Keep It All the Way to Your Sale! The latest attention-grabbing sensation that delivers people to your doorstep! Lightweight and durable, this double-sided brightly colored sign holds up to any weather conditions. At 5 feet in width, these signs are designed to let local traffic know where to find your 5 Day Sale open house! Now Just $225.00 — includes FREE UPS Ground shipping! 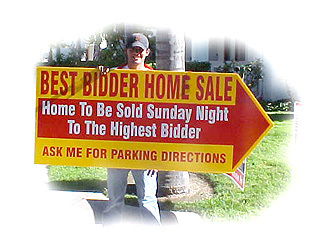 Buy two spinner signs, DOUBLE your visibility for your open house AND save over 15% on your second sign!